Download Opera 10.5 "Pre-alpha" for Windows from Fileforum now. This week marked Google's first release of a development build browser called Chrome 5, which contains some not-yet-fully-implemented features including the browser's first personalized security settings. 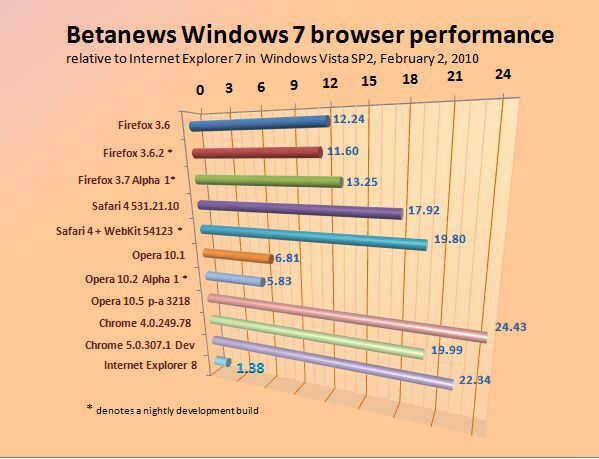 In recent months, Chrome's dev build has been the standard-setter for performance in Windows, with scores in Betanews tests that rise by as much as one point -- one relative quantum of IE7/Vista horsepower -- per month. Now that extensions are a formal part of Google's stable Chrome 4 browser, that trend is changing. And although it's not what anyone can call a complete Web browser (to do that, you really should avoid crashing randomly), the latest build of Opera's "pre-alpha" of version 10.5 continues to send signals that it will keep the afterburners fired up while it puts together a real contender. Despite the fact that you wouldn't want to use it yet as an everyday browser, the latest Opera 10.5 pre-alpha actually increased its lead over the latest Chrome dev build -- now just over two points -- in the latest Betanews tests on Windows 7. Meanwhile, the latest Apple Safari test build with the development version of the WebKit engine remains neck-and-neck against the latest stable Chrome 4, slipping just behind it in today's count. The lower numbers for both browsers do indicate that both slowed down a hair, but also -- in all fairness -- that Internet Explorer 7 in Vista SP2 sped up, as a result of several security patches that appear to have restored much of IE7's lost performance. Although it's not the latest Microsoft browser, IE7 is important to our tests because it helps us establish a benchmark against which browser performance can be judged, that's independent of the hardware. When we give Chrome 4 a 19.99 score, that means we believe that on any computer you choose to test, Chrome 4 on Windows 7 runs about twenty times faster and more productive than IE7 on Vista on the same machine. And by making use of that IE8 score of 1.38, you can easily come to this conclusion: Chrome 4 on Windows 7 should run 14.49 times faster and more productive (loading more text, calculating more formulas) than IE8 on Windows 7. But with a score of 24.43 in our latest Windows 7 tests, the Opera 10.5 pre-alpha renders, crunches, and expedites content 17.7 times faster than IE8. We expect that number to decline a bit as Opera Software fixes this browser to at least "alpha" quality. Yet with a two-point gap over Chrome 5, Opera can actually afford to take it down a notch -- something we never thought we'd be saying just four months ago. Click here for a comprehensive explanation of the Betanews CRPI index version 2.2. Strengths and weaknesses: The code bases for Google Chrome 4 and Chrome 5 should not differ all that much at this point. Indeed, their CSS rendering scores (10.81 and 10.82, respectively) indicate they may not differ at all. But in certain algorithms, Chrome 5 is clearly superior: for instance, in using the MD5 cryptographic hash algorithm, and in executing the "Genetic Salesman" problem -- finding the best highway route between randomly-generated points on a map. Chrome 5's SunSpider score is also vastly superior to Chrome 4's, and 5's handling of CSS selectors is improved as well. Opera 10.5 also posts a high SunSpider score, but not as high as Chrome 5 -- its computational skills are competitive, but not superior yet. CSS rendering capability for 10.5 is improved, but not up to Chrome quite yet. It's in handling old-style Web pages that Opera blows the doors off of the competition, scoring an 11.15 in typical page rendering versus 6.93 for Chrome 5, 3.99 for Chrome 4, and 5.82 for the latest Safari 4 + WebKit nightly build. Stable Opera builds are also strong in this department, but the 10.5 preview tips the scales, and then pulls them down. And in graphics rendering, the 10.5 preview is posting obscene numbers in the Canvas object test. Safari should be the leader here, with the preview build scoring 33.40 and the stable build posting 29.18 -- this compared to 29.11 for Chrome 4 and 26.34 for Chrome 5. Opera's score here is a mind-blowing 66.45; and this is a test that is so above-board that there's really no way to cheat. It's that fast. Mozilla Firefox scores continue to improve, with the latest 3.7 Alpha daily build holding on to a 13.25 overall Windows 7 score -- roughly equivalent to its score from last December, but in the face of a faster relative IE7. Download Google Chrome for Windows Dev Channel build 5.0.301.1 from Fileforum now.